"Catch Living It Up this Saturday on http://www.blogtalkradio.com/mstra-thatgem at 1:30pmcst"
Oh Yes Diamonds and Gents. Skylar Diggins aka Sky Diggs was gifted a car from Jay-Z of Roc Nation. She was one of the number one draft picks of the WNBA. Sky graduated Notre Dame's Mendoza Business College, Ms. Diggs walked outside to the parking lot and seen a white Mercedes Benz. 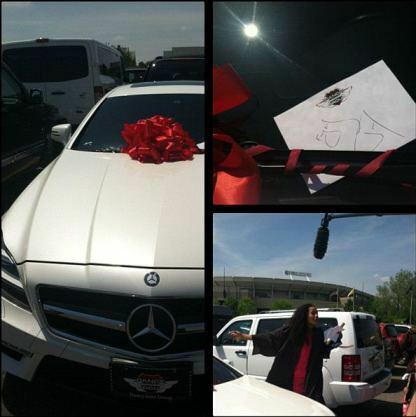 The white Mercedes Benz had a big red bow and a hand written note from Mr. Roc Nation himself. Well, congrads to you Ms. Diggs looking forward to seeing you on the court.